Facebook, Twitter, Instagram, Pinterest, Tumblr. Most of these social networks were only in its infancy or didn’t even exist yet 10 years ago. Now millions and millions of people log onto these social networks at least once a day. Many companies have come to realize the advertising and marketing potential of these social networks and have invested in building and maintaining their presence there. There is no question that millions of eyeballs spend minutes and hours daily on these sites. But what exactly are the demographics of social media users? 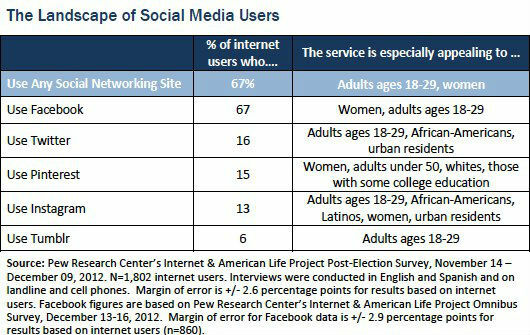 A recent study by the Pew Research Center’s Internet & American Life Project, an independent research group that explores the effect of the Internet on the social, political, and cultural aspects of American life, provides an in-depth look at social media demographics. Some of the findings seem fairly obvious, but the research provided gives an interesting view of who is using the most popular social media networks today. According to the Pew Research Center report, which was conducted in late 2012, those under 50 make up the majority of social media users, and 83% of 18-29 year olds are on social media networking sites. This finding is not all too surprising given that this group came of age as social networks like Facebook began to take off and became intertwined in the social life and relationships of this cohort. The study also found that women are more likely to engage in social media networks and that those living in urban areas use social media more frequently than those in rural communities. Below is a graph representing the findings from the Pew Research Center’s study. What’s your take on these statistics? Share your thoughts in the comments section below.